Do you have any of the wire or wooden stakes left? I ordered my signs without them because I figured there were plenty out there to salvage and I liked the idea of reusing them. Then the city inspectors stopped putting dumping the illegal signs in the dumpster near my house, so I’m a little short of stakes. My sister lives in Chapel Hill and could pick them up for me. Hey Helen. 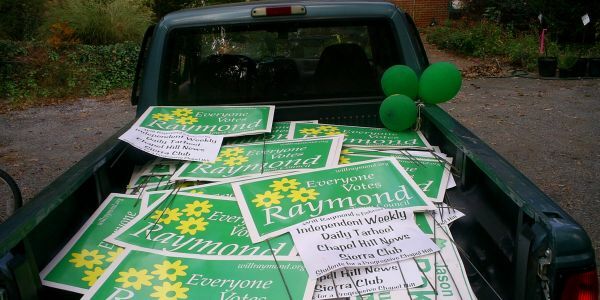 Most of my spare wire hangers, signs (from other campaigns) and stakes have been recycled into the local community. I’ve seen their reuse in everything from neighborhood yard sales to the Emerson-Waldorf School festival. If any shake free I’ll drop you a line. Good luck on your campaign and thank you for running! I’ve still got my 2005 signs in the garage — I’ll put them up soon.